The thing about reactions to and opinions about art and stories and things like that is that they're so personal and tied to individual experiences. So there's no reason for me to try to convince someone who liked Rock On or found it moving that it was, objectively, facile and transparent and shallow, but that's sure how it came across to me. Instead of listing out what didn't work for me - and how none of this rocked me even remotely - and in fact my general philosophy in life is that if you have to put "rock" in the title, your work probably isn't successfully rocking for itself - maybe I should just say that my favorite song (or musical scene) in this movie was the jokingly, drunkenly karaoked version of "I Will Survive." 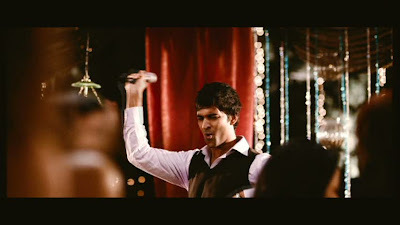 Purab Kohli, playing the most likable character, the very Ringo-y drummer. That was the only one that felt genuine to me, true to the character and the moment. The rest of this was obvious and dull - even the flashbacks to the band's early days told me nothing about them that I couldn't have written myself. I've seen this movie a dozen times, though of course not in Hindi. Give me School of Rock any day. Cultural context may have just thrown up a huge wall for me here, and I am happy to accept that this movie has relationships to mainstream Indina cinema and to audiences who grew up primarily in that context that are very different from how it fits in with the western movies and tv I grew up with. There's little in Rock On that didn't happen a few seasons ago in Degrassi: The Next Generation, for example. And that's fine - there's nothing inherently wrong with different groups of people indulging in the same stories for different audiences or contexts - but it means that Rock On is not the movie for me. ego clashes, pressures to sell out.... I don't at all mind when movies (or novels, or songs, or whatever) dig into the barrel of narrative and emotional chestnuts, but if the story is uncreative, then I need the rest of the project to be imaginative and meaningful in its intent for and use of the chestnuts. Chake De India, for example, was mostly trite on paper but pushed all the right buttons for me and was utterly chock-full of heart. Rock On just didn't. I was so bored. A bunch of man-children upset that they're not able to wield their phallic symbols anymore? No thanks. What was up with Aditya and Sakshi's rain sculpture thingy? That's the most ludicrously excessive piece of set decor I've ever seen in a Hindi movie, and I'm including the sunken living room wrap-around sofas that seat thirty-seven in that comparison. I like to think of it as echoing the clouds and tears in Aditya's pre-band-reunion dil. Awww. Adi is such a stud that you need to see him from two sides at once! 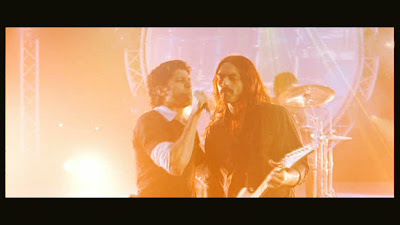 Maybe Farhan and crew were just inspired the split-screen idea from co-star Arjun Rampal's Asambhav! Arjun Rampal successfully channeled the look of circa 1972 George Harrison. Probably not the guitar chops, though. Out of fairness, I should also say that this was the best performance I've ever seen Arjun Rampal give. Love the presence of Pepsi in a film that discussing selling out. Subtle and clever (relatively). You can't quite see it here, but the famous people in the producer's desk and wall photos are Anu Malik, who appears as himself in the film, and Javed Akhtar, whose presence does not need explanation. More meta - apparently that's the theme of the month! Requisite struggling rock band wear: Doors shirt, camouflage, lots of metal jewelry, soul patch. 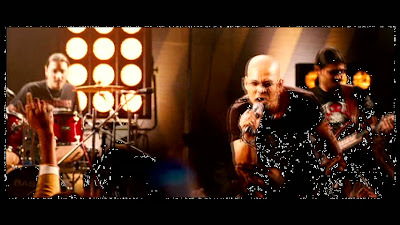 and Memsaab and I both thought it would have been brilliant to have this shaved-head lead singer be a cameo by someone who is decidedly not a shaved-head lead singer of a metal band, like Shahrukh or Abhishek. Or OMG Preity! Ha! What I might dislike most about Rock On is that while I was watching it, my annoyance growing, I had a nagging feeling that maybe I wouldn't like Dil Chahta Hai as much anymore. The two films do share some significant similarities: male friendship (which in theory I'm delighted to see star in a film) among young men of financial and social privilege, the moping of yuppies, illness and death, conflict among friends, "What am I doing with my life?" and "What does my life mean?" questions, a female partner who feels shut out, even heavy use of flashback (though mercifully Dil Chahta Hai has only one, and it tells us a lot about the characters, unlike Rock On's, which built on no imagination whatsoever). On the up side, maybe it will make me grateful that the DCH boys sorted out their issues while they were still in their early 20s and didn't drag out their gloomy dissatisfaction for a whole decade. I'm with Ultrabrown: forget it. And just be glad you were spared an even worse band name than Magik - as Manish Vij says, perhaps "Poseur McCheeseball was already in use." Arjun Ramphal was good in this but he was waaaayyy better in The Last Lear. Have you seen it yet? OH MY GOD, they killed (Luke) Kenny at the end. Bastards!! Trust the 'ghora' to get killed off, just like it was always the black guy who gets eaten first by the monsters on the space ship. You're an odd case, my friend, but at least you're discussing a film I've seen for once! :D Call me conventional, I loved it. 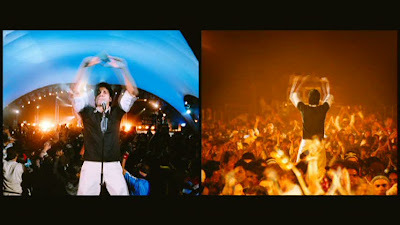 It was not perfect but to me that's more a sign of 2008 as a filmi year than Rock On's own massive failure. To me all the rock clichés and whatnot signified the discovery of this form of music to the Indian mainstream (at least a little) and the way it lacked cynicism which we get hopelessly much of in Western rock culture.. it was just simply re-discovering why I personally loved this type of music; simplicity & sincerity. So I was OK to spend some time watching Rock On but won't be putting it on high rotation othe DVD player. Ahhh...I was waiting for you to compare it with Chakde India which, as you know, I found boring and banal to very end. Maybe I've seen too many sports movies, and you've seen too many rock band movies! But, yes, I agree--the plot was pretty much was boring, and the characters, well, blah. Little things about it I liked: the scene where Aditya's wife is ordering the servant to get boxes out of the closet. The box is 4" from her hand, and she stills tells the servant to open it for her: so exactly what I see every day. Cell phone more than 3' from you when it rings? Get your servant to hand it to you. I also thought the water feature pretty much sums up all the houses here in Delhi in SJE and GK-1, for instance. Those are the sorts of things that made the movie intersting for me. 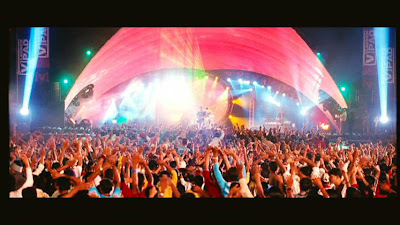 Also, I just read a novel about coming of age at IIT-Delhi, and it fleshed out the "rock band" scene in India for me, so that might have added a little of depth that I wouldn't have otherwise seen in the movie (precious little depth, why the hell was Arjun Rampal's character such a jerk? Never explained.). Having just re-watched DCH twice, I can say confidently that it is still a much better movie than this, although not as good a movie as the first time I saw it, primarily because the moments of filminess really irritate me now (that STUPID VIDEO WITH BUBBLES for instance). Alright! Now that I know someone doesnt like it, I can come out of the closet and accept I dont care for the movie! such a relief! All the boys were really pretty- but other than that it does nothing for me. Although I felt the movie was well-written, I thought it was a boring movie as well. Oh THANK you! I was afraid I would get lynched by the Farhan Fan Club, if I voiced my opinion out loud on Bollywhat! As for DCH, I had a similar thought, and promptly re-watched it - thankfully it holds up. Yes the boys are privileged there as well, but I didn't get much pointless twaddle about how their lives are without meaning because their college friendships broke up. I would also make sure the words "cliched" "predictable" and "derivative" were in there. 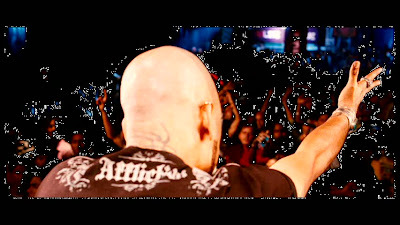 Rock On is not a movie I'd see over and over again (that would be DCH). But I agree with Veracious on this -- simplicity and sincerity made it work for me. Not to sound cynical, but a stadion rock band called "Magik" is conceptually as far from simplicity and sincerity as possible for me. Now, a film about the kind of musician/band who is juggling a day job and his music and trying to make ends meet with the full knowledge that she (and why do it have to be men???) will probably never be able to make a living from it, that I'd like to see. bollyviewer - I probably would have finished even if Memsaab hadn't been there to egg me on, but I can't imagine I'll ever watch it again. I'm very nervous about revisiting DCH, but I have loved it so! Cannot wait to see Luck by Chance! C'mon, DVD! Haven't tried The Last Lear - you recommend? Patrick von S - Hey, thanks for stopping by! Love the Kenny joke - and jealous I didn't think of it. Rob was by far the least annoying gora I've ever seen on Hindi film (Tom Alter close behind, of course). veracious - I think our age difference might have something to do with our different reactions on this one. I'm old and cranky and wanted to give these guys, who in the "now" scenes are roughly my peers, a big ol' thump on the head and tell them to get a grip. Not that they have to stop playing rock music - not at all, and we should all make joyful use of whatever creative well we have! - but that they should actually process their emotions and not shut people out. That's mainly at the lead pair, of course; I have no problems with the back-up guys, who rightly noted that they had always been treated as just that. I also agree that the music was simple and sincere, but for me it was the type of simple and sincere that I can't not laugh at because I'm just not won over by anything it has to offer other than its earnestness. Temple - Yeah, I feel like I've heard people say it was new and ground-breaking, and I just didn't see that - but again, I don't know its India- or Hindi-specific contexts well enough to comment on that. I'd like to revisit Black - I liked it at the time, I think mainly because it's so pretty, but I suspect now I'd share your reaction. I too thought the performances here were fine. I'm not sold on Farhan as a singer, though - I've been singing in organized and sometimes even paid settings since I was about 12, and I'm not impressed. I didn't cover my ears or anything, but...enh. Oh god, Salman as a rockstar. Help us all. Si - Their apartment was AMAZING. So giant! I guess that's some sort of commentary on empty souls or something. What's the novel? Sounds interesting. Shweta - :) Understood! You're safe here. memsaab - Likewise! Oooh Spinal Tap! I have a student worker who's never seen it. HELP. Bitterlemons - I know the feeling! I'm finding it interesting that many people (at least here) are saying the movie is boring - which is the total opposite of what rock, as a concept, is supposed to be, right? Very glad your expert opinion is that DCH holds up. Phew! theBollywoodFan - I agree, many of SRK's movies, or masalas, or whatever else, are also conventional and cliched. But as you say, we all have our preferred recipe and presentation style for typical ingredients. house - I KNOW. Ditto all. That said, Farhan's narrative thread was the one I enjoyed the least out of the four Magick boys. Then again, I didn't much care for Luck By Chance or Akshaye Khanna's story in DCH either - due to the yuppie angst over not being "creative" = boring thing. I also hated Juno, American Beauty, etc. etc. There were a few things that really drew me to Rock On!! : The dynamic between the boys in the band was very realistic - way more so than in other rock movies I've seen; I liked the story between Arjun and his wife; I liked the theme of growing up and letting go of dreams of "stardom." And, most surprisingly, I liked the music. SEL don't do melody well, so they were wonderful with Farhan's untrained voice. In short, I guess Sanni and I will head up the Rock On!! appreciation fanclub! @ houseinrlyeh - not to get overly defensive about "Magick" but they weren't a stadium rock band. In fact, all of the boys' stories dealt with trying to find a balance between day jobs and being creative. Nobody ends up with groupies and a record deal, they find a good balance. And, sorry to say, as a veteran of the rock scene - most people in bands are dudes. That's just the way it is. Rock On!! did feature at least one female singer from a REAL rock band on the soundtrack - and I think in the movie, too. @Filmi Girl: Umm, last time I looked into my record collection, I found a lot of women in there. There may still be fewer women making music (not being "a veteran of the rock scene" but only a music nerd I certainly don't know), but ignoring them in another film just because that's the way it supposedly is does not seem to be a way to be inclusive. And the music from the film I found on the 'net is very much stadium rock for me. @house, I don't want to start bickering on Beth's blog, but maybe you should watch the film before judging it. Sure, there may be lots of women in your record collection - there are in mine, as well - but how many of them are in your local rock scene? My band was often the only one with women in it when we played shows. Rock is and remains a very male dominated genre. And the soundtrack and film do include women in the local scene in the film. I don't see anything to complain about - esp. if you haven't seen it. And secondly, don't judge the narrative of the film based on some tracks you heard online. Just because they sound like "stadium rock" doesn't mean that the narrative was about a successful band with a big record deal who sold out the Budokan.... the band practices in a basement and doesn't have too many gigs. And the narrative does deal with them balancing work and their creative lives. And I don't appreciate you denigrating my experience playing rock music. I think it was perfectly valid to the discussion. So, after seeing the musical numbers in a film I have no right calling them stadium rock even if they are? You know, I really don't care much if you allow me to or not. And just because your local rock scene does mostly consist of men still doesn't mean a film like this should mostly be about men. Oh, I don't "denigrate your experience playing in a rock band", whatever that may mean, I just don't know why your playing in one does make your ideas about women in music more valuable than those of other people - and that's the way your last post as well as this one read to me. I really think it's best we just end this, before you get even more condescending and I get even more annoyed. I feel like explaining my choice of words here; I did not mean the music was simple and sincere, though in some ways it certainly was good, basic rock with a smidgeon of a desi twist (for true desirock you have to listen to true desirock!). I meant that the story told of a simple but sincere motivation of these guys who wanted to express themselves creatively in the form of music. When I first got into rock music, I got into punkrock, and maybe because of that, when you strip away everything else (breaking music down to sub-genres, rock elitism etc), this sort of sincere desire at self-expression and creating something new is what rock, to me, is about. When Rock On depicted that, I was delighted and content. well, count me also in on those who loved RockOn! and I also liked the farhan story-line best. @women in rock-music: sorry but I have to go with filmigirl again. most local bands here (and I am a judge on the biggest rock-music contest in austria) have also mostly male members. Very interesting comments, Beth, especially the last part about DCH. I remember liking DCH (especially for Aamir) but not being overwhelmed by love for it the way most people seemed to be at that time. I haven't even bothered to watch it more than once. Not sure why, actually. Anyway, I loved Rock On although some parts of it were really facile and obvious (especially the ending). I thought it was very nicely shot and I could really relate to some of the themes, like starting over, change, dealing with the past. Again, not mind-blowing stuff, but it struck a chord. Also, like Filmi Girl and Babasko, I was reminded of jamming with friends in my student days and what that felt like. I enjoyed the music and thought the acting for the most part was pretty good. As for DCH, I've been meaning to rewatch myself and wondering if my own opinion would change now. I saw it so early on in my Bollywatching days! This is a very good movie.I like this type of movies.Actually i like those movie which have a great friend bonding,Thats why SHOLAY got top ranking in my Favorite list. Huzzah! Sita Sings the Blues is available online!